5-Tab Poly Binder Index Dividers are made from acid-free polypropylene which contains an additional additive that allows it to biodegrade when tested according to the ASTM D5511. 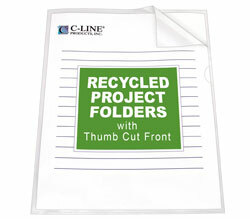 * Fits standard 3-ring binders. Assorted colors include blue, aqua, pink, smoke and clear. 5/PK. * Learn about ASTM testing and the time and conditions it takes for these products to biodegrade..